Discussion in 'Reviews and Articles' started by tweakmonkey, Jun 12, 2007. [align=right][gars_ad]null[/gars_ad][/align]What's the safest and fastest way to download a ton of music from a specific artist? It seems that of all techniques used to download music, a simple Google search may be the most underrated or least common -- yet it's one of the easiest, fastest, and most reliable. You really ought to try it if you ever download music over the Internet. After all, a search will certainly yield at least a moderate collection of downloadable MP3s. Sometimes you'll even find compressed RAR or ZIP files with whole albums of artists you couldn't even find CDs for at your local music store. A little practice goes a long way, so let's briefly explore this search technique. * Note that you are downloading music and files at your own risk. We take no responsibility for your decision to download potentially illegal music and/or viruses. Three distinct pieces of this URL may cause some confusion. For all sites on Google, we're looking for the text index of in the title portion of the pages. This title usually indicates that the page is a directory index (or "folder index" if you prefer) that was added to Google's search index. In other words, you'll see the directories of web servers, and not the web pages that are on that page. This allows you to download any file easily and view several files at once. Next, on the actual pages we're seeing, we look for the phrases last modified and parent directory, as well as the words description and size. This further eliminates doubt as to whether this is a directory index. For an example of a directory, see this folder on Mozilla's FTP. This was the first result when searching for intitle:"index of" +"last modified" +"parent directory" +description +size firefox. 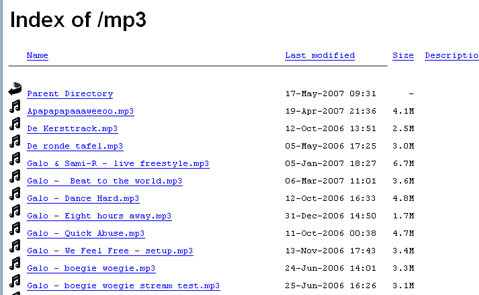 The bit in parenthesis: (wma|mp3) specifies to only show pages with either MP3 or WMA files. So in theory, this query will search all sites with MP3s or WMAs in an index listing. So you're just seeing a bunch of people's music folders. The last part of the URL is simply my search query. In this case it was thievery corporation I was searching for. The worst part about this technique is clicking through the different sites while you try to find a valid list of files that can be downloaded. It may not work at first, but you'll find that after a few different searches and some scouring through the results, you'll be better at finding music with this technique. Don't forget to check the cached version of a page if it looks like it may have been taken down. Warning: Many sites will try to capitalize on this by creating pages that look like indexes, but are clearly advertisements or full of junk. The best way to eliminate these pages from your results is to carefully analyze the authenticity of an index. Does it have logos? Advertisements? Pictures? The more text and less pictures here, the better. You want an index, not a web page. This is clearly an index, and not a site covered in advertisements or links to download anything but music. Hovering the mouse over a link indicates that the path is a link to genuine MP3 file and it may actually be here. Right click, Save As, and you've probably now got yourself a full audio file off a lightning-fast connection. Sometimes you'll find whole CDs in these index listings as RAR or ZIP files, so keep your eyes peeled for these especially. You could even alter your search query to use the phrase (ZIP|RAR) instead to only look for archives. - Maximum anonymity. Most of these sites are from random servers all over the world, and administrators are probably not even aware the music is on the server or accessible to the public. - Fast. Most of the indexes will have a very fast connection speed since you're using a leechable HTTP server or FTP. - Portable. You won't need to install any programs or configure a router, which makes this the ideal technique for some workplaces or when you're not at home. There are sites (like this one) that automate this process with queries of their own, but you may find that Google works just fine. It may be handy to either keep this query handy: intitle:"index of" +"last modified" +"parent directory" +description +size +(wma|mp3) *perhaps through memorization* or just bookmark the results page and refine the search as needed. Another site worth checking is The Hype Machine which puts the music in a player so you can stream it and listen on-the-fly. This post was inspired by this story, which has more tips on this subject. Thanks for reading. If you liked this article, you may like this one, explaining how to get music from a Myspace page onto your computer, a CD, or an iPod. Wow, well I didn't think it would be that easy. It took me about 15 minutes to get 3 albums I have been after for awhile. Probably the easiest way I have ever downloaded music. I mean bought. Not bad. I've learned that whenever I find a link to a DJ mix to try viewing the "folder" it is in, which has often turned up sweet caches of stuff that wasn't linked from the main website, but this should turn up some more goodies. Is there a way to do this for Videos? Yes. Just change the "MP3" or "WMA" string to WMV|MPEG|MPG|AVI|MOV (for example). I don't know what quality/size videos you'll find but it will work just the same. Here's a sample search result. Modify as needed. Thanks Dan, this works really well. If you go there, at the top of the page you can just drop in a search for an artist or song, and they have all the things laid out already. Don't forget about other codecs. For music you also add OGG, WAV, AAC, M4A, MPC. For videos there's also OGM and I'm sure many more that I can't think of yet. I can't believe how few people still use this trick. Any time a new album comes out, especially by an artist that's not mainstream, it's super easy to find the whole thing on Google. I think it's always easier to snag it off iTunes, but some people prefer to pillage and plunder rather than spend $1. Oh no doubt, I'm all about plundering but the rare-ish titles are sometimes hard to find.